Habit: Randia aculeate grows as a shrub to 5 m in height. The plant can be unarmed or armed with spines. The leaves are arranged oppositely with ovoid, acuminate, paired stipules at the petiole base. The leaves are clustered at the ends of reduced branches, ovate to obovate, to 6 cm in length with a round leaf apex and an entire margin. Randia aculeata is considered dioecious. The flowers are clustered in leaf axils or solitarily at branch tips. The calyx has 5 partially fused green sepals. The corolla has 5 white petals fused that form a salverform tube with dense white hairs in its throat. In staminate flowers there are 5 functional stamens fused to the top of the corolla tube. 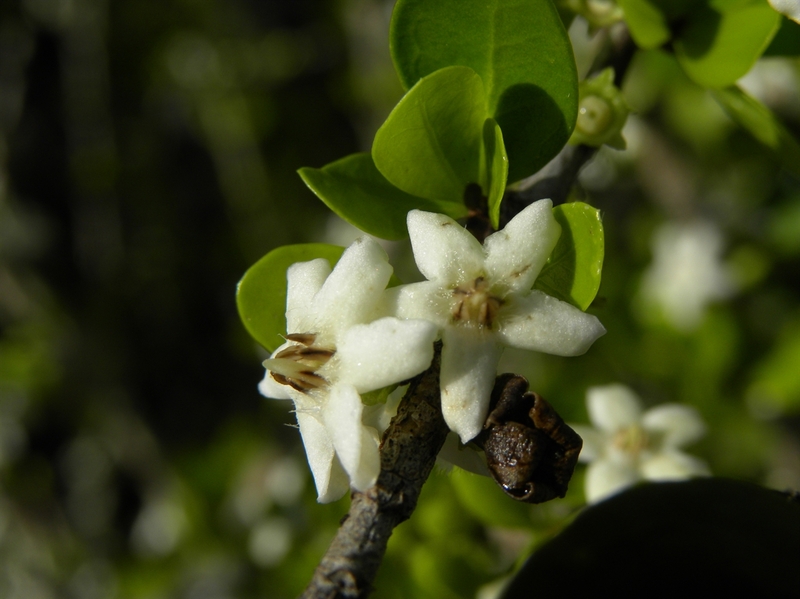 In carpellate flowers the ovary is inferior with 2 locules and numerous seeds. The fruit is a berry turning white at maturity. Habitat: Randia aculeata grows in Dry Broadleaf Evergreen Formations – Forests/Woodlands/Shrublands/Dwarf Shrublands as well as Pine Woodlands and coastal rock formations. Distribution in Bahamas/Globally: Randia aculeate occurs on all island groups in the Bahamian Archipelago as well as Florida, the entire Caribbean region, and Central and South America. Medicinal/Cultural/Economic usage: Randia aculeate has no known medicinal uses in the Bahamas. Elsewhere in the Caribbean the fruits have been used to treat diarrhea, fever, and the sap to stop hemorrhaging. In the Lesser Antilles the wood has been used to making cooking instruments and fishing rods. The fruits are edible but not very tasty. The berries have been used to produce ink and dyes. The fruits support a diverse avian population. Randia aculeata is part of the horticultural industry in southern Florida.